Just like any other college sport, esports members receive scholarships, attend regularly scheduled practices, compete in tournaments and have a team manager. Missouri Baptist University announced its esports team on Feb. 25, 2015, which led to official competitions beginning in the fall semester of 2016. The coach of the MBU esports team, Andrew Douglas, is not only the team’s first coach, but he also initiated the conversation to orchestrate an esports team with John Yehling, previous head coach of the men’s volleyball team and Douglas’s coach at the time. Douglas was a member of the varsity volleyball team at MBU for his freshmen, sophomore and junior years as a backup setter. After winning a national championship his junior year, he “decided to retire from competitive volleyball to give someone else an opportunity to win a national championship, and that ended up happening,” Douglas said an email. Douglas made the proposal for the esports team after Yehling overheard his conversation with his teammates about the growing collegiate scene of esports. “John and I knew this was a really good opportunity to get in on something that was new to the collegiate scene so we made sure to build a strong proposal and make a good impression,” Douglas said. Douglas and Yehling brought the idea to Dr. Keith Ross, MBU president who was senior vice president for institutional advancement at the time, to get his opinion to start the program. “He loved the idea, so he was a huge reason why we got it approved,” Douglas said. “League of Legends” and “Rocket League” are two of the most popular games played competitively in colleges throughout the nation. 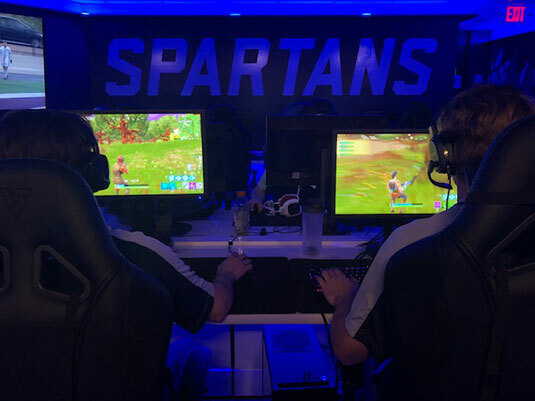 “Fortnite” is new to MBU’s team this year, and though it’s their first year of competitive play, it is exploding with popularity. Nearby esports competitors include Maryville University, Fontbonne University, Saint Louis University, Southern Illinois University Edwardsville, Culver-Stockton College, University of Missouri, Missouri State University, Columbia College, Southwest Baptist University and Principia College. After using several temporary spaces, which included rooms with no air conditioning and thin walls that prevented the team from communicating while playing, and after losing practice time due to setting up and tearing down equipment, the team finally found its home on MBU’s main campus in the basement of the W.L. Muncy Jr. Gymnasium. When renting time in the SRC Conference Room, as they were originally allowed to do, the team had to dedicate over an hour to setting up and tearing down equipment. The Spartans’ first season brought them a 7-3 record, followed by a 2-2-2 record in their 2017-18 season. The team uses PCs instead of gaming consoles like many other collegiate esports teams. “We built our own PCs, which run around $1,100 apiece,” Douglas said. “Building the PCs allowed us to save a little bit of money because we cut out the middle man,” like computer stores and e-outfitters. The monitors have a 144 hertz refresh rate, which produces a fluid image that refreshes the screen 144 times per second. Esports players bring their own keyboards, mice and headsets because of every individual’s preference. Since games can last for multiple hours at a time, each player has his own gaming chair called the Vertagear Racing Series S-Line SL200, which can sell for a little over $300 each. “The main reasons for the chairs are comfort and appeal. They look really cool, which is great for attracting recruits,” Douglas said. The coach recruits year-round through online forums and reaching out to local high schools. After coming across MBU’s esports team in a local news article, Lucas Garza, senior psychology major who was in high school at the time, contacted Douglas about the team. With the new designated esports gaming room, athletes can practice between classes or during free time to improve their individual skills. During team practices, the players scrimmage against other universities and review the recordings of games to critique their communication and improve as a team, sometimes for three or more hours at a time. All three games, “League of Legends,” “Fortnite” and “Rocket League,” have online multiplayer options to allow players to compete against people from around the world at the same skill level. As rankings change per game, the level of competition advances as well. The team has not traveled for tournaments, but they have opportunities to do so in the future. 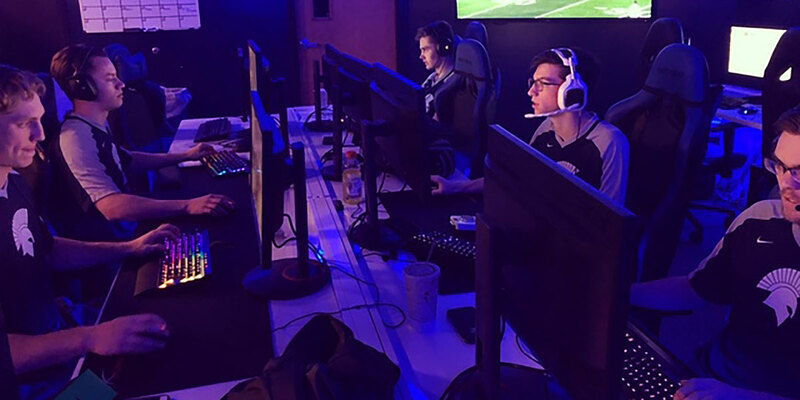 Many schools host LAN tournaments, which stands for local area network tournaments, where schools throughout the nation travel and compete for cash, scholarship money or in-game currency. The League of Legends Championship Series is coming to St. Louis for playoffs this April. The LCS plays in Los Angeles during the season and tours the nation for playoffs. There are many career opportunities for professional esports leagues, which has led collegiate esports members to pursue these leagues after earning their degree. “The esports scene is huge. There are jobs in playing, coaching, broadcasting, game design, event management, streaming and much more,” Douglas said. MBU’s first graduate of the esports program, Jeff Hamm, a 2018 graduate with a bachelor’s degree in business administration, went on to coach the esports team at Daemen College in New York. Despite the team’s struggle to find a designated practice facility on campus, the news of the esports team has spread across campus, leading students, faculty and staff to stop by to see the new space and appreciate how far they have come. Douglas recently announced this is his last season coaching the team as he has accepted a position at Maryville University as a technology specialist, but he’s confident the MBU esports program will continue to thrive. 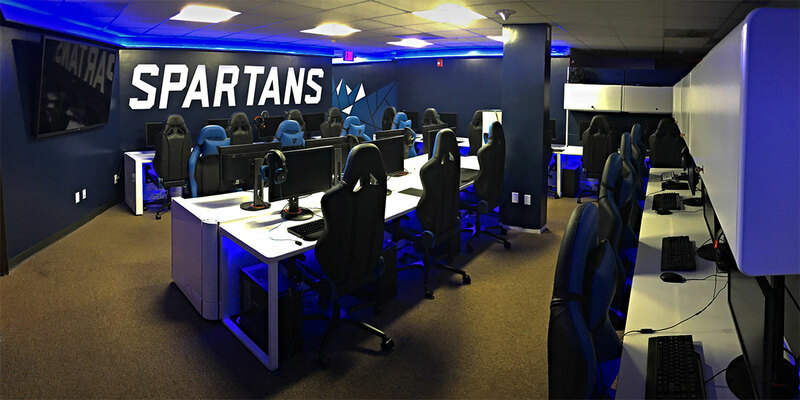 An inside look at the esports room in the Muncy Gymnasium at Missouri Baptist University. Gamers earn scholarships, compete online against colleges nationwide and even get to use these high-tech custom ergonomic chairs.